HOT HOT HOT New ALL Laundry Coupon - NO SIZE RESTRICTIONS! SHARE OR TAG A FRIEND SO THEY CAN PRINT IT TOO!!! UPDATE: IF THE LINK/PICTURE ABOVE DOESNT WORK THEN TRY>> $1.50 ANY one All Product (Zip code 01234 or 77477)<< if you click the link it will take you right to the clipped and ready to print coupon! 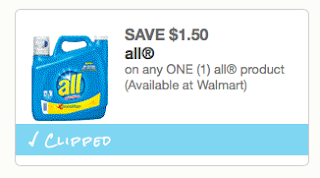 I AM NOT SEEING A GREAT DEAL FOR THIS COUPON THIS WEEK BUT PRINT AND SAVE, MINE DOESNT EXPIRE UNTIL 7/23! THERE WILL BE A DEAL BEFORE THEN! !